The techniques are not difficult, if you can cut out and sew, you can make these quilts. This is a two day, no sew class. The quilt is made with bright fabric squares which are cut and then joined back together to “make” a “new” fabric. The result is a fractured artistic style, with unique results. Relax and enjoy the creative process of “making” your fabrics, and then preparing your pieces on a dark layer which makes them stand out from the background. You will design your background layout, and then arrange and fuse your completed pieces on it. 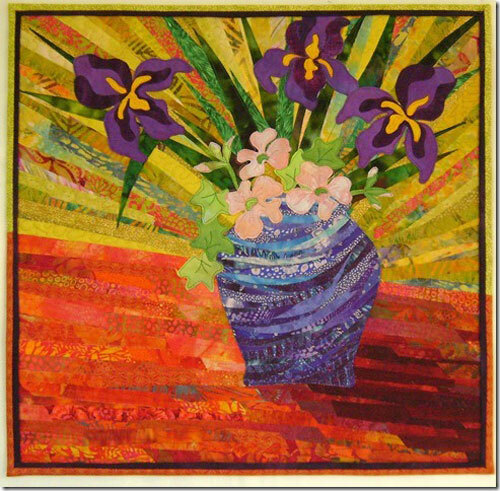 Once you are home after the class, it will take you just an hour or so, to quilt your piece. The simple quilting, done with a walking foot, also acts as the stitching on the appliqué, eliminating the need to stitch around each piece. Fabric requirements are modest, you need small amounts for the appliqué and background; you will also need fusible webbing, and a sharp pair of scissors. This quilt is made with 6” squares as the quilt above, these are cut and then joined back together to “make” a new fabric. The result is a fractured artistic style, with unique results. A fun alternative version of the above, with different results. 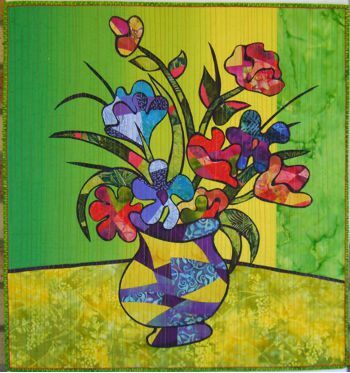 Using fusible techniques, you will “create” a new fabric. Then you will cut the new fabric into shapes to make the design. Back the shapes with black (or a colour of your choice), and stitch the quilt using straight line stitching. 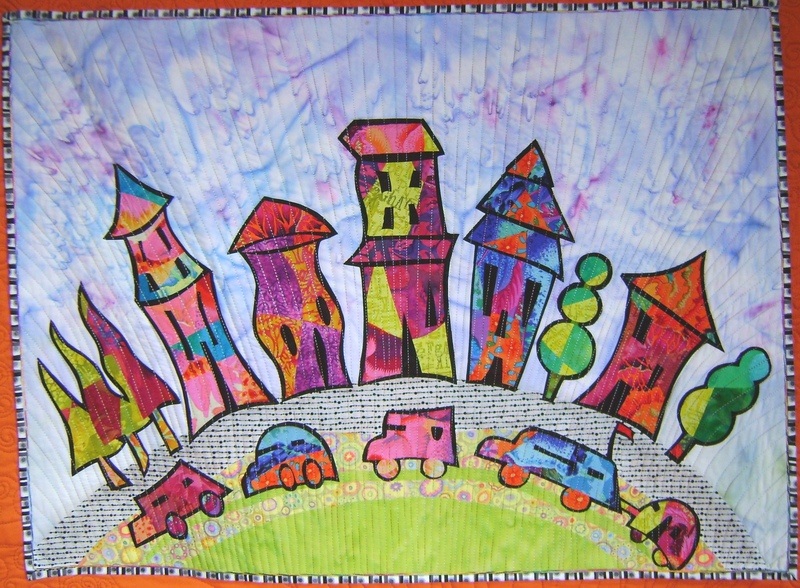 This can be a no sew class, relax and enjoy the creative process and complete the quilting at home, quilting takes approximately one hour. This project is suitable for all levels of experience, two day class. This is a one day, sewing class. 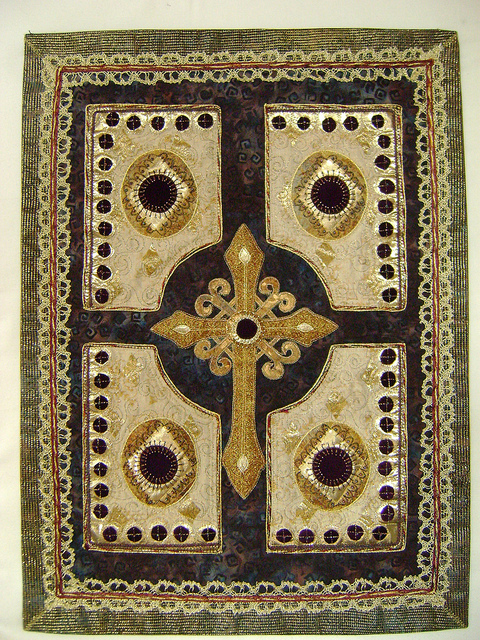 Spend a day stitching the wall hanging with lovely enhancements of gold paint and thread. The stitching is mostly done with the open toe foot; alternately you may use a darning foot and free motion stitching if you are confident with that method. 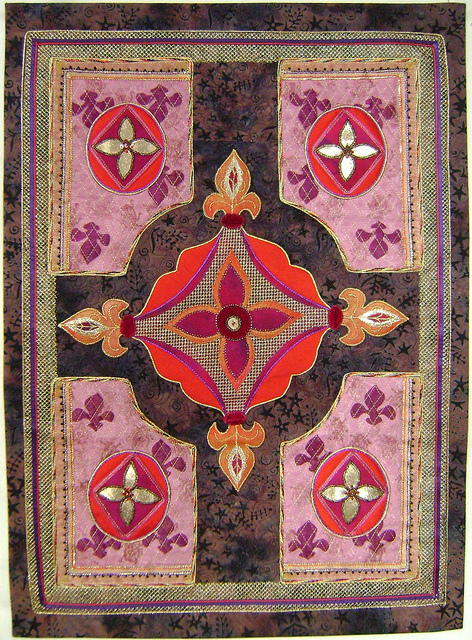 You might like to prepare a background at home, by tea dyeing a fabric, or use a commercial fabric for your background. After transferring the design to the background with stitching, you will then enhance the design with gold thread and paint. 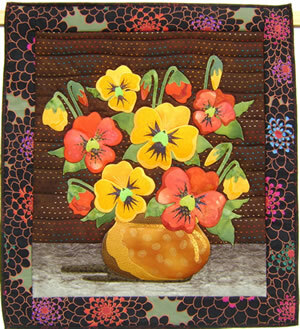 Using the scraps from other projects, an easy and fun class. Scraps of fabric are trapped under tulle and flowers are fused and stitched. Quilting is easy and your quilt will be unique. Two different colour schemes for you to try. You might have another colour scheme in mind. Gorgeous antique pink pansies in a golden bowl… or dark red in a black bowl. Machine appliqué using fusible web. This is a one or two day class, suitable for everyone. 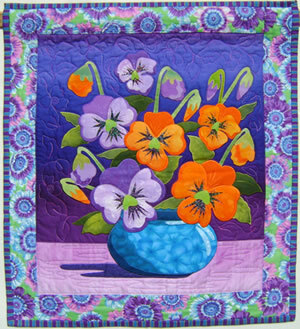 This quilt marks a departure from my flower quilts. Scraps of organza, silk, velvet, gold Lame and gold net are combined to create an antique look inspired by medieval book covers. You will be able to use your special fabrics to create a piece which is unique to you. I used some silk and velvet, but mainly cotton fabric with organza, cord, purchased trims and some gold lame’. The techniques used are quite simple, with spectacular results! Everyone can make this quilt. 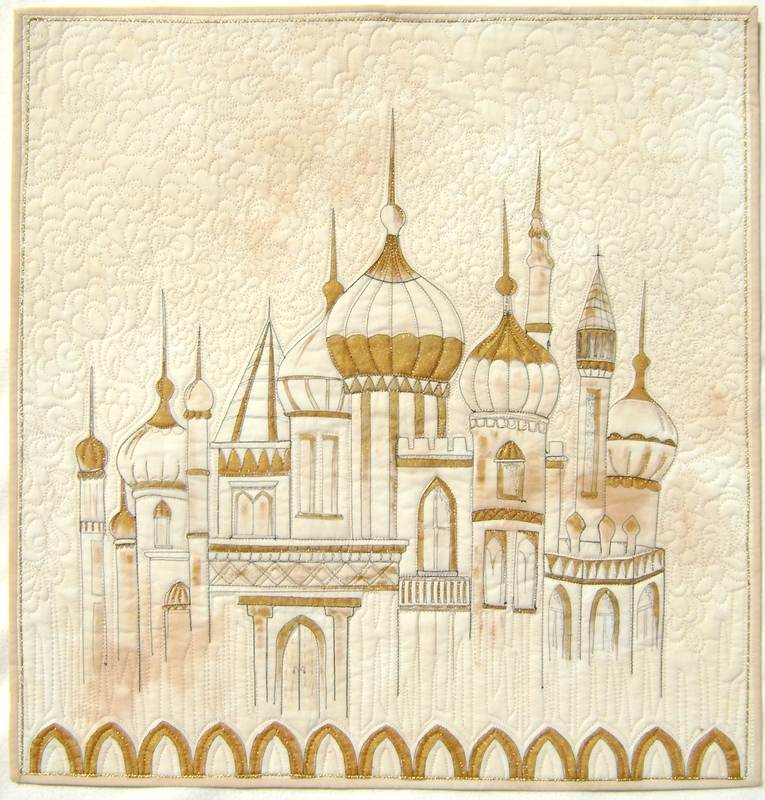 Create a rich embellished surface, with use of special fabrics such as silk and satin, and beading and lots of machine stitching with metallic threads. 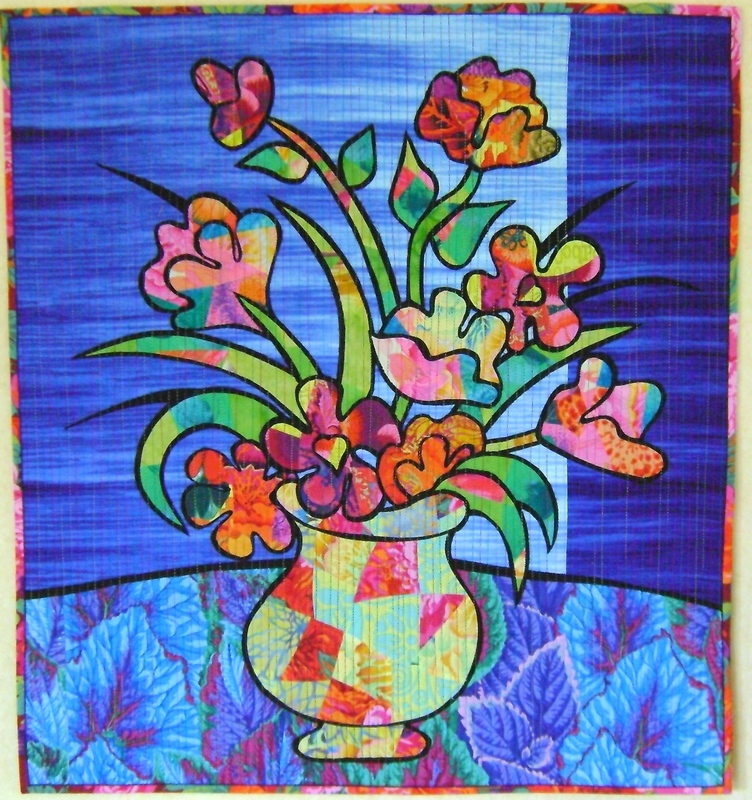 The flowers and leaves “float” on a previously quilted surface. 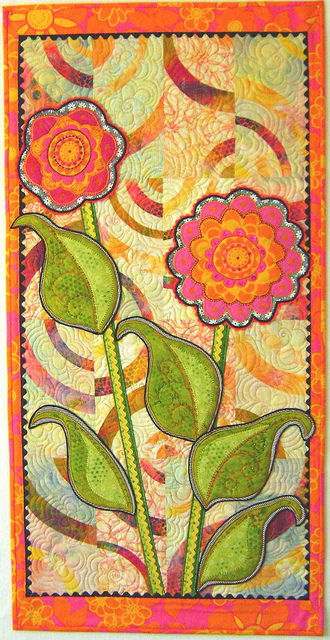 See also the other quilt in this section for a more modern twist. You will be able to choose between these two quilt styles in your class. You will not complete a whole quilt in this class but will learn the techniques used. Your quilt will be unique! 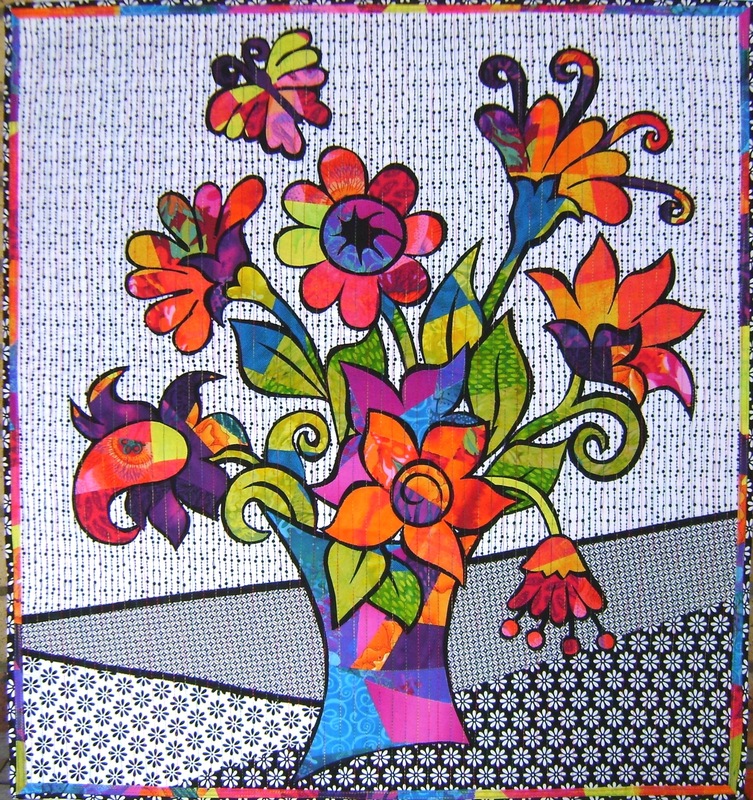 This is another version of Surface Edged Flowers. As you can see this one uses ric rac braid as edging and trim. You could also use other purchased trims. You will not complete a whole quilt in this class but will learn the techniques used. You could use a whole cloth background. You will also be given directions for the pieced background.